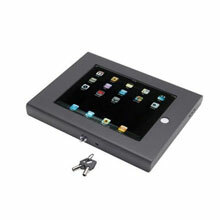 MMF Rhino Elite Series - Apple iPad 2 Enclosure, MagTek Credit Card Reader Opening, Home Button Opening, Black. The MMF Rhino Elite Series is a lockable tablet enclosure for either the Apple iPad2 or iPad1, which can be mounted on a table stand or combined with MMF"s Mounting Solutions with its VESA mounting pattern. Made from aluminum, and powder-coated with silver or traditional black texture paint, each enclosure comes with a push lock and can accommodate an additional cable lock for added security. Rhino Elite Series enclosures are radio transparent, allowing Wi-Fi, Bluetooth, and 3G to remain fully functional. There is a specific cut-out for the power cord on the back panel of the enclosure to keep the tablet powered at all times. The Rhino Elite Series is also available with an opening for the MagTek iDynamo Credit Card Reader for easy customer payments. The MMF 225-7201-04 is also known as MMF Cash Drawer	225-7201-04	or 225720104	.